Viking Runecraft slot is very different from what you may be used to. No, the theme isn't that unusual especially from Scandinavian developers like Play'n Go and Netent who often like the mythological references in their games, a few examples being Dragon Ship, Hall of Gods and Viking's Treasure. It is the fact that this game doesn't have win-lines as will be explained shortly. The slot is certainly a spectacular production with a large range of sound effects and visuals all becoming the mighty Norse Gods and is quite complex to describe. I think the best I can do there is tell you it's a hybrid of Cloud Quest and Gemix with Viking Gods and symbology and a lot of effort has gone into its development, almost a 'production' rather than a slot game! Well, there are no reels a such, but we have a 'cascade' style game with a 7x7 grid, which fills up with tiles from above, like Gonzo's Quest for example. You need to get any pattern of adjacent tiles of 5 or more to win anything, for example 5 in an 'L' shape or 2x2 square with one more attached, but no diagonals count. You can win up to 5000x bet with enhancements accumulated, but the basic icons pay from 5 to 15 of-a-kind. The top is Thor's Hammer paying 1000x for a block of 15 then his Helmet, Axe and Breastplate at 375, 150 and 120x bet respectively. 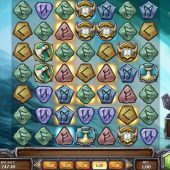 The remaining icons are Rune Stones of different colours going down in increments of 15x bet from the highest at 75x to the lowest at 15x. There is no Wild unless granted randomly which we will soon see. On the right of the game you have Thor who may randomly improve any losing spin. You start as 'Journeyman' and once you have had winning combinations covering all positions of a pattern superimposed behind the tiles you move up to 'Clansman' and Odin will take Thor's place on the right and so-on until you rise to the level of 'God'. The levels basically increase the values for the special features you can win cumulatively. On the left of the game there is a prize wheel which has a cash award that grows as you get wins consisting of the 5 runes. When you land a specified pattern, say a 'T' the wheel will spin and up to 5 colour Runes (if all 5 lit and on the wheel) will form 5 winning symbols along with 5 dead positions on a 10-segment wheel, so if you land on a Rune you will win that pool of cash. If you get 20 or more tiles in one series, you then trigger the 'Charge' which will get the God in play to benefit your grid with one of the four Charges Of Destruction possibilities. Another 20 icons at this stage trigger the mighty Ragnarok Free Round. 40 or more symbols in one spin will also award the Ragnarok Free Round. Thor - lightning strikes from 5-9 Wilds on the screen. Odin - 4 Wilds are created in groups of two. Freya - light creates Wilds in four clusters until a win is created. Heimdall - one Wild symbol is added to all 7 rows. When triggering the 40+ icon accumulator, you will trigger the Ragnarok Free Round. During this you will get the 4 Charges Of Destruction in a random order spun on a special wheel, and also a multiplier increases for any wins from 2 to 15x the final total. You will either get one of them for 20+ winning icons removed in one spin, or all 4 for triggering Ragnarok by accumulating 40 winning icons in one spin. 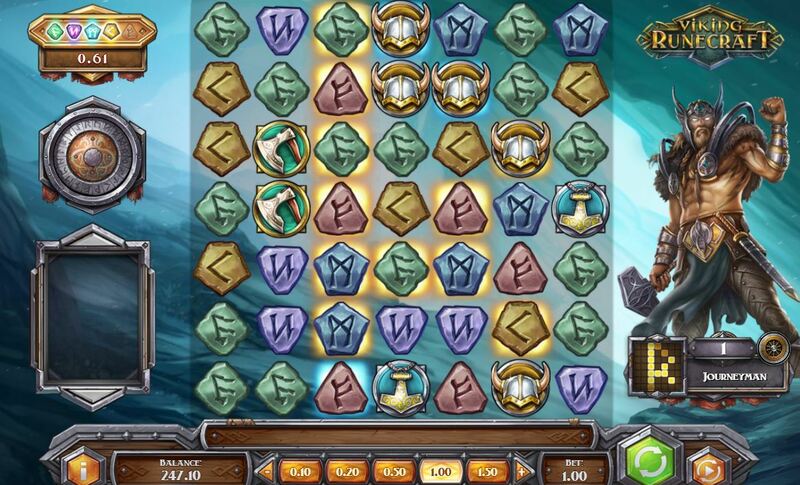 Fury of Fenrir - 4 diagonal lines are selected, 2 are removed and the other 2 changed into the same symbol and may or may not land in a way to form a big win. Judgement of Jormungandr - a chain of symbols is chosen and most destroyed but some changed to the same one. Scorching of Surtr - three symbols are chosen, the surrounding ones destroyed and and the selected symbols duplicated in their place. Lure of Loki - all of 2 different symbols are chosen, one destroyed and then changed to the other one chosen.